Questions about the how cars should interact with bike lanes, and how cyclists can make the most of them are common. The questions persist because both driver and cyclist education on the subject has not kept pace with the expansion of the infrastructure itself. (a) A vehicle shall be driven, as nearly as is practicable, entirely within a single lane or line of traffic and shall not be moved from such lane or line until the driver has first ascertained that such movement can be made with safety. (b) Upon a roadway which is divided into three (3) lanes and provides for two (2) way movement of traffic, a vehicle shall not be driven in the center lane except when overtaking and passing another vehicle where the roadway is clearly visible and such center lane is clear of traffic within a safe distance, or when preparing for a left turn, or where such center lane is at the time allocated exclusively to traffic moving in the direction the vehicle is proceeding and is posted with signs to give notice of such allocation. (c) Official signs may be erected directing specified traffic to use a designated lane or designating those lanes to be used by traffic moving in a particular direction regardless of the center of the roadway, and drivers of vehicles shall obey the directions of such signs. (e) Except for the operator of a bus entering or exiting an authorized bus stop, the driver of a motor vehicle shall not drive, upon any on-street path, lane, trail or multi-purpose lane designated by official signs or markings for the exclusive use of bicycles or other non-motorized transportation or otherwise drive or place the vehicle in such a manner as to impede bicycle traffic on such path, lane, trail, or multi-purpose lane unless entering or exiting a legal parking space, alley, private road, driveway, or preparing to make a turn. Let’s break that down into easy to understand strategies for all road users. The bicycle lane is another lane of traffic, just one reserved for cyclists. Crossing a bicycle lane in a perpendicular fashion (i.e. entering a parking lot) is fine provided that there is not a cyclist approaching. 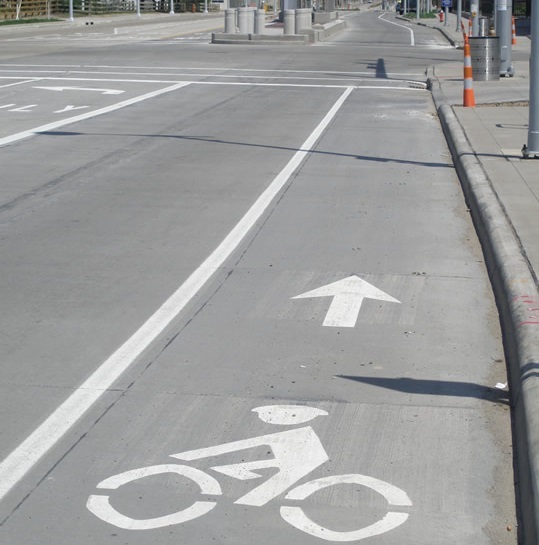 The cyclist has priority traveling in the lane – the same as if it were a vehicle in a traditional lane. When approaching a right turn, it is allowable to merge into the bike lane between 50-200′ before the turn provided that there is no cyclist present, and be sure to check your mirror and over your shoulder. You will often (but not always) see the bike lane striping changed to a dashed line in these zones. Always use your turn signal in advance to alert other road users to your intent. If you remain in the vehicle lane when approaching a right turn, a cyclist may assume you will be continuing straight. NEVER accelerate abruptly to pass a cyclist only to make a hard right turn in front of them! When approaching a left turn, look across the the intersection for cyclists on the curb side as oncoming traffic. The bicycle lane is your lane, but expect cars to cross and merge into it at times for the reasons noted above. Always be alert for vehicles crossing your lane, especially in areas with busy entry points across it. You have the right of way, but know that vehicles often misjudge your speed – so plan ahead and be proactive. When approaching intersections, take extra caution as vehicles pass to your left. Keep a keen eye open for brake lights and turn signals and prepare to slow down. Stay steady and predictable. Do not remain in a driver’s blind spot, even if it means slowing down a bit. The small amount of time lost is worth it! Cleveland roads can present unexpected hazards. Potholes, debris, and other variants can cause both drivers and cyclists to swerve into each others’ lane in avoidance. Those that impact safe bicycle travel can be reported here. That is why vehicles must always keep at least a 3 foot buffer zone between cyclists when sharing the road. This is why the passage of the 3 Foot Law is another critical step in establishing solid guidelines to keep the road safe for All Drivers.